Saraiah is the baby daughter of Jeremiah and Veronica. 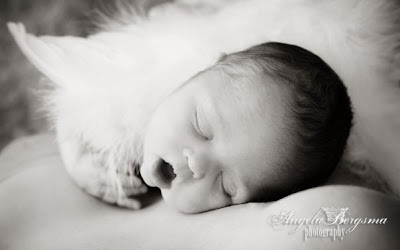 She was born January 4 with Down's Syndrome and severe heart defects. After much prayer and consultation with medical professionals, Saraiah's parents decided to take her home, expecting her to live anywhere from a few hours to a week. Four months later, Saraiah is doing well. So what can Realtime Church do for this family? PRAY! This sweet little girl needs our prayers. Very specifically, pray that the left side of her heart grows so that surgery will be possible. Pray for Saraiah's mommy and daddy. They are going through an extremely difficult situation and need to continue to have the emotional stamina to face each day. We will keep you updated, but for now- PRAY! Your response to families over the Christmas season was amazing. The Realtime church community has proven that we can band together quickly to make a difference in peoples lives using Facebook, Twitter, e-mail, and the Internet in general. 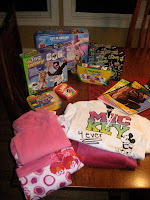 H ere are two pictures of the gifts that you donated to families this Christmas. The first picture went to Eric and Amy whose family was not going to have much of a Christmas because of Amy's recent accident. The gifts in the second picture went to Janine, whose daughter with Down's syndrome had her gifts stolen two days before Christmas. Amazingly, you helped raise over $3200 for a swing set for Kate McRae. Realtime church has been going for a couple months now, and you have already done amazing things. Beyond the situations above, we have helped in a renovation project and we have been a place for people to post their critical health needs. But there is so much more to do. The biggest problem that we encounter is that we have to seek out projects to work on. Not that we mind the work, but it seems that out of the thousands of hits on our site, people are afraid to post critical situations. While we are not an organization that pays bills or mows lawns, you never know how influential we can be when we all band together. We need to develop a Realtime Church culture where people are constantly scanning their surroundings for critical situations to post? What needs are out there? He may or may not have anything good to say, but it will probably be entertaining and slightly inappropriate. Heather is 27 and she lives in Colorado Springs, CO where she teaches theater and dance. Several years ago she began to get pinched nerves which led to back surgery and she has now been diagnosed with Neuropathy, which is a degenerative nerve disease that attacks the nerve's ability to control the muscles. She experiences intense pain and things that were once simple like climbing a few stairs, now take a momentous amount of work. She has to get injections every week, see numerous doctors, have blood work done, and do physical therapy to manipulate her muscles and nerves. This young woman is facing such a world of struggle. Please be in prayer for her. Pray that the everyday tasks in life aren't too difficult. Pray for peace. Pray that the right people come around her to support her. stating that you'd like to know more about Heather.